If you are like us at Modest Money, the holidays are approaching and you haven’t finished your shopping. Perhaps my family is the exception, but I find them incredibly difficult to buy for. I have found the following approach serves me well, making each family member feel loved and appreciated, without spending too much or leaving anyone disappointed. 1. Give Fun/Money. This is the sleight of hand method. Because my family each has diverse interests I know nothing about – my brother the sports broadcaster, my mom the tropical fish enthusiast – I can not hope to add meaningfully to their hobby. They know so much more about it than I do, it’s best left to them to buy stuff for themselves. A well-intentioned gift card is always happily received. But it’s not fun to unwrap, and doesn’t really communicate the “spirit” of holiday gift-giving. So if I give gift cards or cash, I always make sure to include an “experience” gift that everyone can enjoy. This could be an exciting new game that the whole family can play together, a special dinner out for everyone, even just a movie after the big meal. Just giving your family time to enjoy together is one of the best gifts. I let them handle buying the stuff they want on their own. 2. If You Don’t Know What to Buy, At Least Buy Quality. Sometimes there is no right answer for what to buy a loved one. In these situations, if I don’t think the gift card route will suffice, I’ve been known to buy nice things. A Pendleton blanket for mom and alpaca slippers from brother were big hits. These are things they’d never think to buy for themselves, but they really enjoy having. What’s more, I always leave them the receipt, if they want to exchange their gift for something else. “Comfort” goods like these make great gifts, and Couponbox.com or MoneySavingExpert.com or even As Seen on TV can help you get them for a lot cheaper. Yes be sure to never forget to use coupon codes when shopping online. It’s such an easy way to save. 3. Do Something Homemade. This can stretch as far as your own skills and creativity allow. My wife is the queen of this method. She’s an artist, and gave out hand painted portraits of our dog and cat to my family. She’s also got a great sense of humor, so these goofy presents were well-received. For those not artistically inclined, homemade soaps, sweaters, foods, and jewelry all let your folks know that you appreciate them and that you think about them. You can also save a lot of money this way. 4. Forego the Gifts, and Give to Someone Else. A lot of families are hard to buy for because everyone already has everything they need. If this is you, talk to you family about giving to someone in greater need this time around. There are plenty of gift-giving programs and volunteer hours to be filled throughout the chilly holiday months. If gift-giving isn’t the same as it was when you were a kid, help share the experience with kids today, those that don’t have what you had growing up. Holiday gift giving need not be stressful. There are many strategies to have each one of your friends and family feeling appreciated and thankful. Take one of the routes listed above, or come up with one of your own. As always, it’s the thought and intention that matter (just save the receipt). 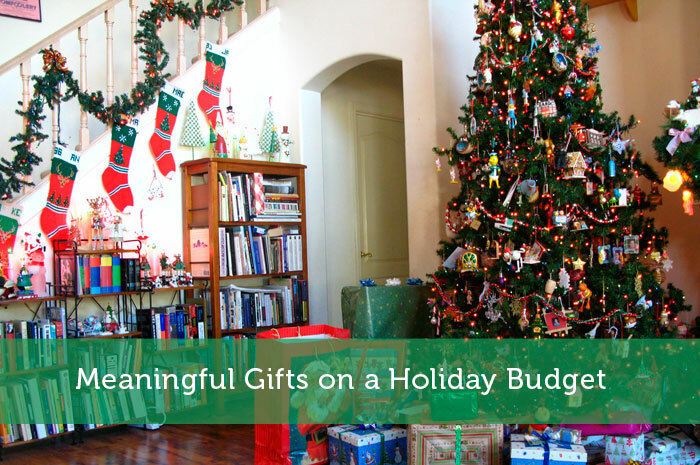 I’m glad to read this article about Meaningful Gifts on a Holiday Budget. Its additional learning and many great tips here. It’s very helpful and useful especially now Christmas time. Thanks for sharing this article. It’s such a great post. Great ideas! Shopping for my dad and brother is so hard because we don’t have the same interests. I have given giftcards and cash before, but it’s not nearly as exciting to open. I am big when it comes to giving meaningful gifts vice pricey because that’s what’s in. I think another cool gift for young people are itunes gift cards. Everyone can use a itune gift card right? I really like the idea of giving experiences instead of gifts. Most of us don’t need more stuff and so I find these to be much more meaningful. Donating to charity in someone’s honor is another wonderful idea. I really agree with you about giving homemade items. Generic store bought gifts are quickly forgotten, but homemade gifts, like a good story, linger in people’s memory. Sweet bread and cookies make great gifts. In following Lincoln’s sentiment, sometimes, with due modesty, I give a book I have written.